Franz De Waal has spent four decades at the forefront of animal research. 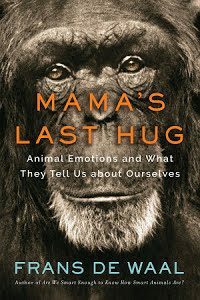 Following up on the best-selling Are We Smart Enough to Know How Smart Animals Are?, which investigated animal intelligence, Mama’s Last Hug delivers a fascinating exploration of the rich emotional lives of animals. Mama’s Last Hug begins with the death of Mama, a chimpanzee monarch who formed a deep bond with biologist Jan van Hooff. When Mama was dying, van Hooff took the unusual step of visiting her in her night cage for a last hug. Their goodbyes were filmed & went viral. Millions of people were deeply moved by the way Mama embraced the professor, welcoming him with a big smile while reassuring him by patting his neck, in a gesture often considered typically human but that is in fact common to all primates. This story & others like it form the core of de Waal’s argument , showing that humans are not the only species with the capacity for love, hate, fear, shame, guilt, joy disgust, & empathy. De Waal discusses facial expressions, the emotions behind human politics, the illusion of free will, animal sentience, &, of course, Mama’s life & death. The message is one of continuity between us & other species, such as the radical proposal that emotions are like organs: we don’t have a single organ that other animals don’t have, & the same is true for our emotions. Mama’s Last Hug opens our hearts & minds to the many ways in which humans & other animals are connected, transforming how we view the living world around us.